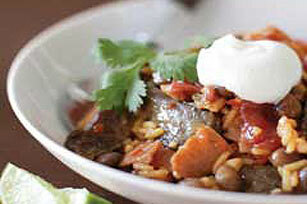 How do you make an already-hearty achiote steak-and-rice skillet even heartier? Add pigeon peas, diced tomatoes and chopped ham. Heat dressing in large skillet on medium-high heat. Add meat; cook 2 min. or until browned. Remove meat from skillet; set aside. Keep warm. Add rice and ham to skillet. Cook 2 min., stirring occasionally. Stir in water and seasoning mix. Bring to boil; cover. Reduce heat to low; cook 15 min. or until rice is tender. Stir in meat, pigeon peas and tomatoes; cover. Cook 5 to 10 min. or until heated through. Top with sour cream before serving. Sprinkle chopped cilantro and a squeeze of lime over the dish before serving for a refreshing taste. If you like to add a little heat to your dish, simply finely chop a jalapeño and add it along with the ham and rice.